THE B-MOVIE NEWS VAULT: 80's Action Stars Battle Slashers in 10 TO MIDNIGHT & COBRA! 80's Action Stars Battle Slashers in 10 TO MIDNIGHT & COBRA! 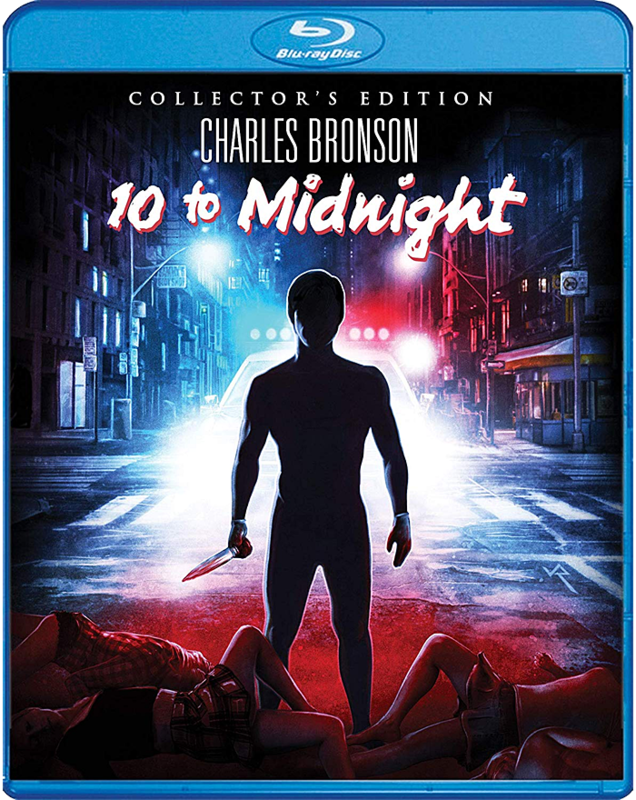 CHARLES BRONSON AND SYLVESTER STALLONE TAKE ON SERIAL KILLERS IN SCREAM FACTORY'S NEWEST COLLECTOR'S EDITION BLU-RAYS! As much as it pains me to say it Vault Dwellers, I have never seen 10 TO MIDNIGHT. This is a real tragedy because I love Charles Bronson and I love slasher flicks! I vow to remedy this injustice as soon as possible. (This weekend maybe?) COBRA on the other hand I am quite familiar with - looks like it's time to upgrade from my old DVD (which is nestled in one of those awful cardboard snap-cases that never really caught on). While I'm already convinced that I need both of these Blu-ray discs, maybe those of you reading this post are on the fence? Well if that's the case, let's take a closer look at both releases! NEW! Charlie’s Partner – An Interview With Actor Andrew Stevens! NEW! Producing Bronson – An Interview With Producer Lance Hool! NEW! Remembering Bronson – An Interview With Actor Robert F. Lyons! NEW! Undressed To Kill – An Interview With Actress Jeana Tomasina Keough! Audio Commentary With Producer Pancho Kohner, Casting Director John Crowther, And Film Historian David Del Valle. Synopsis: Lt. Cobretti (Sylvester Stallone) is a one-man assault team whose laser-mount submachine gun and pearl-handled Colt .45 spit pure crime-stopping venom! Director George P. Cosmatos (RAMBO: FIRST BLOOD PART II, TOMBSTONE, LEVIATHAN, OF UKNOWN ORIGIN) teams up again with Stallone for this thriller pitting Cobretti against a merciless serial killer. The trail leads to not one murderer but also an army of psychos bent on slashing their way to a "New Order" – and killing a witness (Brigitte Nielsen) along the way. Fortunately, her protector is Cobra, a man who delivers vigilante justice like no other! NEW! Stalking And Slashing – An Interview With Actor Brian Thompson! NEW! Meet The Disease – An Interview With Actor Marco Rodriguez! NEW! Feel The Heat – An Interview With Actor Andrew Robinson! NEW! Double Crossed – An Interview With Actress Lee Garlington! NEW! A Work Of Art – An Interview With Actor Art LaFleur! Audio Commentary With Director George P. Cosmatos! 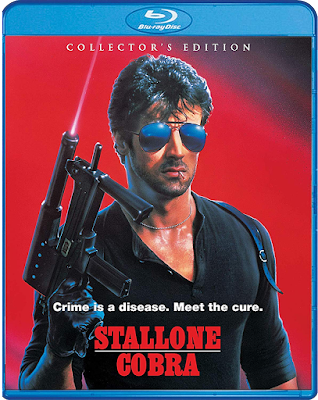 Scream Factory's Collector's Edition of COBRA is also now available and should cost approximately $24. Get your dose of 80's Stallone action now from AMAZON, BULL MOOSE, DIABOLIK DVD, or directly SHOUT! FACTORY.